Home » TCA Blog » Uncategorized » Interactive Art Project in Tuscany! Interactive Art Project in Tuscany! 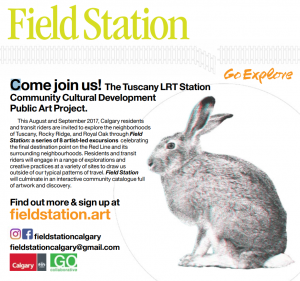 FIELD STATION is a series of arts-based community events that comprise the Tuscany LRT Station Community Cultural Development Public Art Project. Both educational and creative, Field Station includes individual and collective opportunities to celebrate the local community and explore the final destination point on the Red Line and its surrounding neighbourhoods. In August and September 2017, Calgary residents and transit riders are invited to explore the Tuscany, Rocky Ridge, and Royal Oak neighbourhoods through a series of artist-led excursions. The project team will guide participants in a range of hands-on activities, such as drawing, printmaking, and collage, at a variety of sites to draw residents and transit riders outside of their typical patterns of travel. Art-making activities will become a vehicle to explore and imagine, while building upon participants’ connection to place. 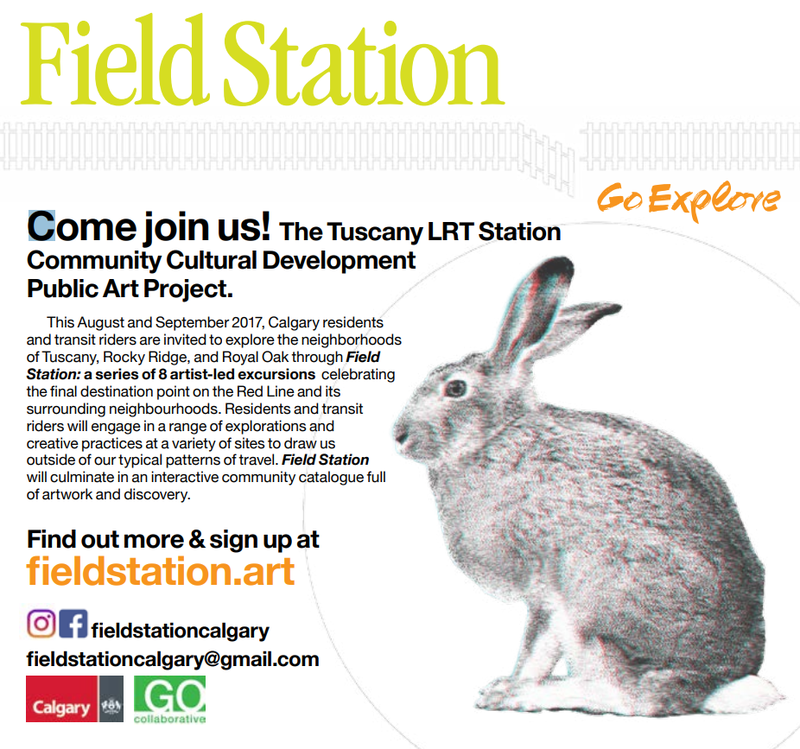 Visit FieldStation.art to find excursion specifics, project news, and connect with the artists. SATURDAY, AUGUST 26th, 2017. 10am – 12noon. SUNDAY, AUGUST 27th, 2017. 2pm – 4pm. Meeting place: Tuscany Neighborhood, details to be shared by email. MONDAY, AUGUST 28th, 2017. 10am – 12noon. SUNDAY, SEPTEMBER 17th, 2017. 2pm – 4pm. SATURDAY, SEPTEMBER 16th, 2017. 2:30pm – 4:30pm.